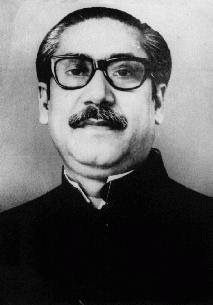 Today is August 15th, and it's the 33rd anniversary of the assassination of Sheikh Mujibur Rahman, the first President and Prime Minister of Bangladesh, and the father of the nation. Known as Bangadandhu, or "Friend of Bangladesh," Sheikh Mujibur Rahman is a larger than life figure in history, and is revered in Bangladesh as George Washington is revered here in the United States. In fact, there are many parallels between the American Revolution of 1776 and the Bangladesh Revolution of 1971. Below is a speech by Sheikh Mujibur Rahman with audio in Bangla, but translated into English for the convenience of us bideshis. This is a good introduction to the events of 1971 and the resulting independence movement. It's also pretty clear why Bangabadhu was such an effective leader. On this day in 1975, a group of junior military officers staged a coup d'etat and assassinated Sheikh Mujib and his entire family. His only family members that lived were two of his daughters who happened to be visiting Germany at the time. One of those daughters is Sheikh Hasina Wajed, who would become the head of the Awami League political party in Bangladesh and serve as Prime Minister from 1996 to 2001. Today, Bangladeshis the world over are pausing to remember this great man and his sacrifices that ensured the liberty of his people.